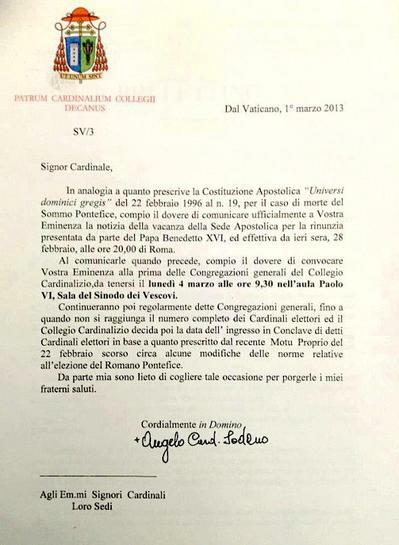 This is the letter the cardinals received from the Dean of the College of Cardinals, Angelo Cardinal Sodano, calling them to the General Congregation. The meetings begin on Monday, March 4, at 9:30am. At 8pm Rome time on 28 February 2013, the Chair of Saint Peter went empty. 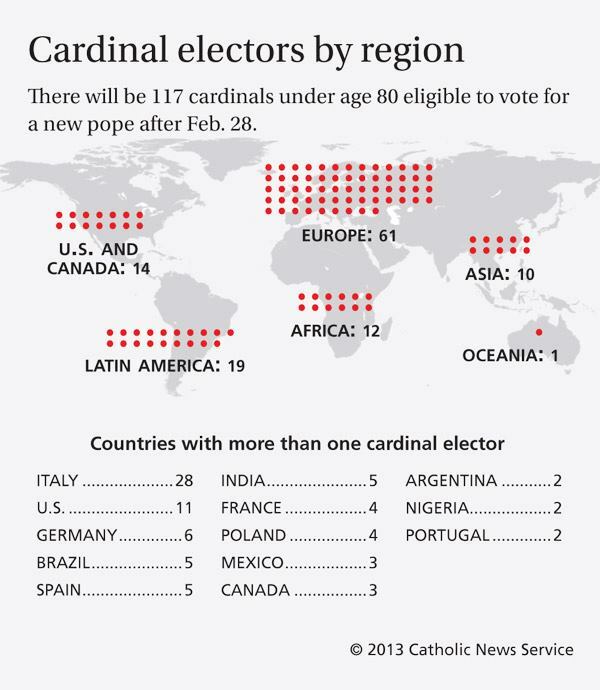 The period of time is called sede vacante, the empty see; that is, the Holy Roman Church has no visible head on earth. There is no pope. 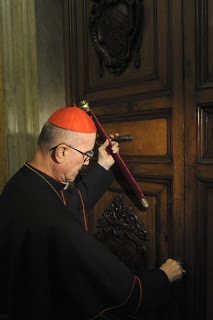 Until the time the cardinal electors gather for the Conclave to elect the next bishop of Rome, the head of the Apostolic Chamber, the Carmerllengo (chamberlain), Tarcisio Cardinal Bertone, SDB, will lead a small group of people in closing the papal apartments, and the private elevator. Prayers were prayed, and tasks identified. Doors were locked and a ribbon with wax seal secured the papal area. The Camerlengo is the acting head of state and is the Church’s administrator of the material holdings of the Church. This office is in distinction to the Dean of the College of Cardinals, Angelo Cardinal Sodano, who cares for the spiritual well-being of the cardinals and chairs the meetings prior to the conclave. 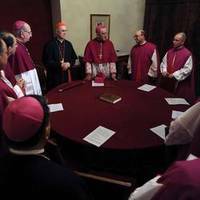 The Vatican embassies also received communication at 8pm saying that any diplomatic necessity ought to be addressed to Archbishop Giovanni Becciu and to the Dean of the College of Cardinals. Today, at 12:30pm Rome time, Archbishop PierLuigi Celate, the vice-Camerlengo, sealed off the Basilica of Saint John Lateran. The basilica is the cathedral for the bishop of Rome. Rome Reports has a good visual on the sealing of the papal apartments. that the fisherman’s ring, and the lead seal, will be broken. Benedict is scheduled to arrive in Castel Gandolfo on 28 February, at 5:15pm -Rome time. At 8pm, Rome time), when the See of Peter goes vacant, the Swiss Guard will quietly leave the papal summer residence; the Guard’s services of protection are limited to the person of the Pontiff; the security of the “Pope Emeritus” will be assured by the Vatican Gendarmerie. 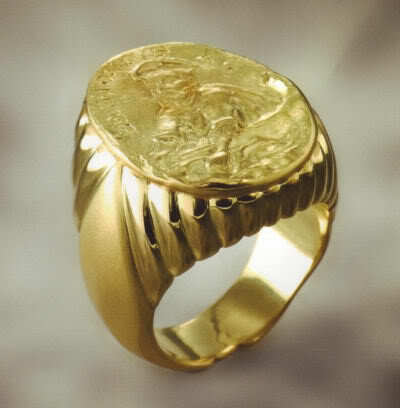 As commentary, some opined that the papal ring could be given to the Vatican Museum but the decision was made to continue to break the break to show the end of this papal reign. Perhaps the broken ring will be given to the Museum if it is not crushed beyond recognition. It seems to me that in Benedict’s case, he ought to be readmitted to the College of Cardinals, be known as His Eminence, Joseph Cardinal Ratzinger, Bishop-emeritus of Rome. Moreover, he ought to adopt the clothes of a cardinal and be given the titular church of Sant’Anselmo or Santa Maria in Trastevere. I’d like him to be given the Benedictine Church of Sant’Anselmo! In 1936, the King of England, Edward VIII, abdicated, he was first known as HRH Prince Edward, and then, HRH the Duke of Windsor. Recently, Her Majesty Queen Beatrix of the Netherlands announced that she was abdicating throne on 30 April. Thereafter Beatrix will be known as Her Royal Highness, Princess Beatrix. You can only have on monarch at a time.